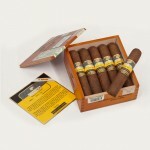 Bolivar Belicosos Finos is a strong cigar derived from the generous fields of Vuelta Abajo region which is the premium tobacco growing area in Cuba. You can enjoy mind-blowing aromas of wood and dried fruits enriched by a spicy end. An oily wrapper consistently encloses this rich blend and strong smoke. This perfect Campana performs no draw problems thanks to its great craftsmanship.